13.10.2. There is an Rmd file with all the code and explanation. 13.11.2. How can version control help me make my work more open? 13.12.2. Using Binder to provide a dynamic version of our document. During this lesson, you’ll learn how to use RMarkdown for reproducible data analysis. We will work with the RNAseq data from the yeast mut and wt dataset from last week. The data are from this paper. This lesson will get you started with RMarkdown, but if you want more, here is a great angus-esque tutorial. Start up an m1.medium instance running Ubuntu 18.04 on Jetstream. We will be using the salmon output from the yeast RNA-seq analysis we did last week. In case your instance was deleted, we have the data here for you. So we’re all working with the exact same data, please download the counts and the transcripts per million from salmon. The last command will uncompress the file and put everything inside the markdown_tutorial folder. Let’s go in the folder and see what files and folders are there. What we are interested now is the ExploratoryAnalysis.Rmd file, which is an RMarkdown file - we can view this on RStudio. You are welcome to look at markdown-angus-rnaseq-viz.Rmd as well, but that’s not the file we’re using this year. Now go to that Web address in your Web browser, and log in with the username and password from above. Literate programming is the basic idea behind dynamic documents and was proposed by Donald Knuth in 1984. Originally, it was for mixing the source code and documentation of software development together. Today, we will create dynamic documents in which program or analysis code is run to produce output (e.g. tables, plots, models, etc) and then are explained through narrative writing. Parse the source document and separate code from narratives. Execute source code and return results. Mix results from the source code with the original narratives. A narrative to explain the results from the analysis code. Note #1: R Markdown is very similar to Jupyter notebooks! They are two sides of the same coin. We suggest that you adopt which ever one makes more sense to you and is in a layout that has a lower barrier for you to learn. A software tool written in Perl. Converts the plain text formatting into HTML. Main goal of Markdown:Make the syntax of the raw (pre-HTML) document as readable possible. Would you rather read this code in HTML? Or this code in Markdown? If you are human, the Markdown code is definitely easier to read! Let us take a moment to soak in how much easier our lives are/will be because Markdown exists! Thank you John Gruber and Aaron Swartz (RIP) for creating Markdown in 2004! 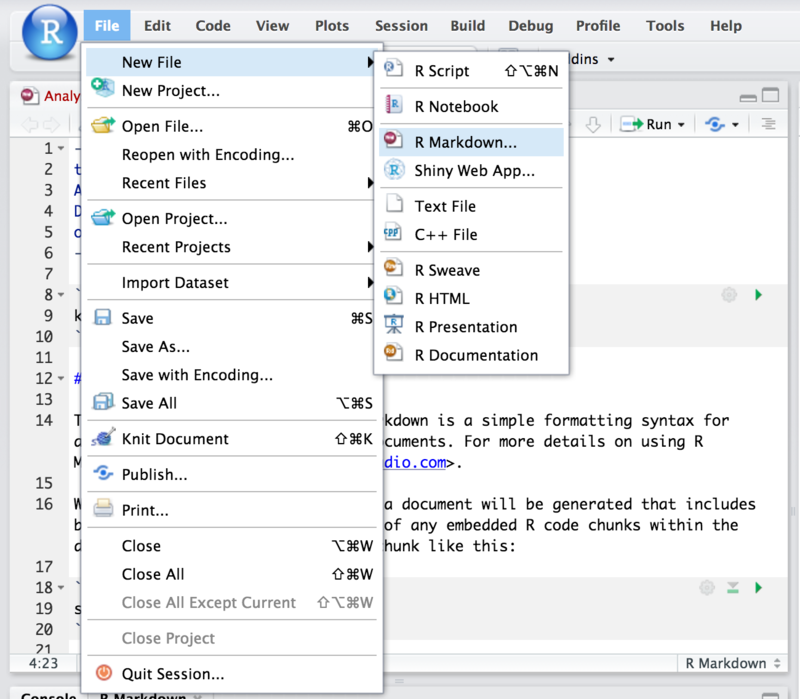 RMarkdown is a variant of Markdown that makes it easy to create dynamic documents, presentations and reports within RStudio. It has embedded R (originally), python, perl, shell code chunks to be used with knitr (an R package) to make it easy to create reproducible reports in the sense that they can be automatically regenerated when the underlying code it modified. Write the content with RMarkdown syntax. Embed the R code in code chunks or inline code. Create .Rmd report that includes R code chunks and and markdown narratives (as indicated in steps above.). Give the .Rmd file to knitr to execute the R code chunks and create a new .md file. Knitr is a package within R that allows the integration of R code into rendered RMarkdown documents such as HTML, latex, pdf, word, among other document types. Give the .md file to pandoc, which will create the final rendered document (e.g. html, Microsoft word, pdf, etc.). While this may seem complicated, we can hit the button at the top of the page. Knitting is the verb to describe the combining of the code chunks, inline code, markdown and narrative. Note: Knitting is different from rendering! Rendering refers to the writing of the final document, which occurs after knitting. It’s go time! 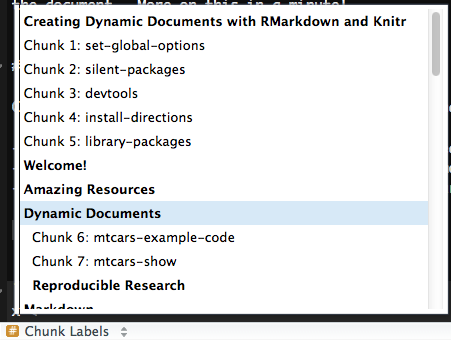 Let’s start working with RMarkdown! Or click on the button in the top left corner. Inside of this window, choose the type of output by selecting the radio buttons. Note: this output can be easily changed later! The above example will create an HTML document. However, the following options are also available. Today, we will create HTML files. Presentation slides take on a slightly different syntax (e.g. to specify when one slide ends and the next one starts) and so please note that there is a bit of markdown syntax specific to presentations. 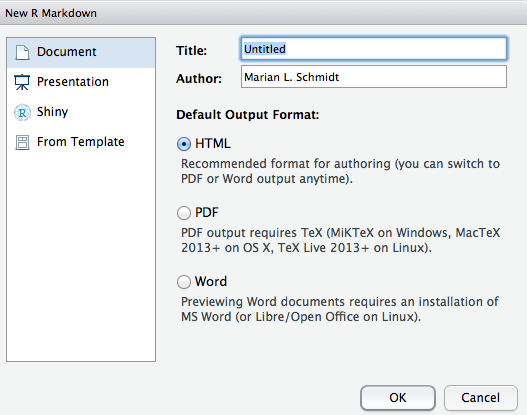 For this section of the document, you will use markdown to write descriptions of whatever the document is about. For example, you may write your abstract, introduction, or materials and methods to set the stage for the analysis to come in code chunks later on. There are 2 ways to embed code within an RMarkdown document. Inline Code: Brief code that takes place during the written part of the document. Code Chunks: Parts of the document that includes several lines of program or analysis code. It may render a plot or table, calculate summary statistics, load packages, etc. Inline code is created by using a back tick (this is usually the key with the ~) (`) and the letter r followed by another back tick. For example: 2^11^ is `r 2^11`. Imagine that you’re reporting a p-value and you do not want to go back and add it every time the statistical test is re-run. Rather, the p-value is 0.0045. This is really helpful when writing up the results section of a paper. For example, you may have ran a bunch of statistics for your scientific questions and this would be a way to have R save that value in a variable name. Code chunks can be used to render code output into documents or to display code for illustration. The code chunks can be in shell/bash, python, Rcpp, SQL, or Stan. Always name/label your code chunks! Generating external files such as images and cached documents. Chunk labels often are output when errors arise (more often for line of code). Navigating throughout long .Rmd documents. When naming the code chunk: Use - or _ in between words for code chunks labels instead of spaces. This will help you and other users of your document to navigate through. Chunk labels must be unique throughout the document (if not there will be an error) and the label should accurately describe what’s happening in the code chunk. results = "asis" stands for “as is” and will output a non-formatted version. collapse is another chunk option which can be helpful. If a code chunk has many short R expressions with some output, you can collapse the output into a chunk. There are too many chunk options to cover here. After the workshop take a look around at the options. Great website for exploring Knitr Chunk Options. Knitr makes producing figures really easy. If analysis code within a chunk is supposed to produce a figure, it will just print out into the document. Options include: "left", "right", and "center"
fig.path: A file path to the directory to where knitr should store the graphic output created by the chunk. There’s even a fig.retina(only for HTML output) for higher figure resolution with retina displays. You may wish to have the same chunk settings throughout your document and so it might be nice to type options once instead of always re-typing it for each chunk. To do so, you can set global chunk options at the top of the document. For example, if you’re working with a collaborator who does not want to see the code - you could set eval = TRUE and echo = FALSE so the code is evaluated but not shown. In addition, you may want to use message = FALSE and warning = FALSE so your collaborator does not see any messages or warnings from R.
If you would like to save and store figures within a sub directory within the project, fig.path = "Figures/". Here, the "Figures/" denotes a folder named Figures within the current directory where the figures produced within the document will be stored. Note: by default figures are not saved. Global chunk options will be set for the rest of the document. If you would like to have a particular chunk be different from the global options, specify at the beginning of that particular chunk. Hand writing tables in Markdown can get tedious. We will not go over this here, however, if you’d like to learn more about Markdown tables check out the documentation on tables at the RMarkdown v2 website. kable: Within the knitr package - not many options but looks nice with ease. pander: Within the pander package - has many more options and customization. Useful for bold-ing certain values (e.g. values below a threshold). A bibliography file with the information about each reference. Check out the very helpful web page by the R Core team on bibliographies and citations. If you would like to cite R packages, knitr even includes a function called write_bib() that creates a .bib entries for R packages. It will even write it to a file! Automatically the bibliography will be placed at the end of the document. Therefore, you should finish your .Rmd document with # References so the bibliography comes after the header for the bibliography. Citation Style Language (CSL) is an XML-based language that identifies the format of citations and bibliographies. Reference management programs such as Zotero, Mendeley and Papers all use CSL. Search for your favorite journal and CSL in the Zotero Style Repository, which currently has >8,000 CSLs. Is there a style that you’re looking for that is not there? Citations go inside square brackets [ ]and are separated by semicolons ;. Each citation must have a key, composed of @ + the citation identifier from the database, and may optionally have a prefix, a locator, and a suffix. To check what the citation key is for a reference, take a look at the .bib file. Here in this file, you can also change key for each reference. However, be careful that each ID is unique! Create your awesome .Rmd document. Click the button to render your HTML document to be published. In the top right corner of the preview window, click the publish button and follow the directions. Note: You will need to create an RPubs profile. The URL in which the website will be hosted. If you make some changes to your document it is very easy to update the web page. Once you have rendered your edited document click the button on the top right corner of the preview window. The edited document will be in the same URL as the original document. 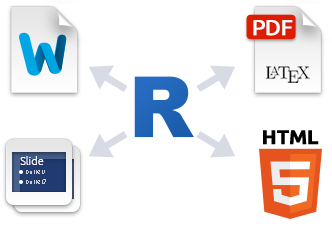 The RMarkdown website hosted by RStudio. Dr. Yuhui Xie’s book: Dynamic Documents with R and Knitr 2^nd^ Edition [@Xie2015] and his Knitr website. A BIG thank you to Dr. Xie for writing the Knitr Package!! Dr. Karl Broman’s “Knitr in a Knutshell”. We still have all the example code, so let’s see what our first hmtl looks like! Click the knit button near the top of your screen. In order to knit a file, it has to be saved. Let’s call ours ExploratoryAnalysis. Once you save the file, it should automatically render and then open so we can look at it. We have a navigable Table of Contents! We’ve all been in this situation before: it seems ridiculous to have multiple nearly-identical versions of the same document. Some word processors let us deal with this a little better, such as Microsoft Word’s Track Changes, Google Docs’ version history, or LibreOffice’s Recording and Displaying Changes. Unless there are conflicts, you can even play two sets of changes onto the same base document. A version control system is a tool that keeps track of these changes for us and helps us version and merge our files. It allows you to decide which changes make up the next version, called a commit and keeps useful metadata about them. The complete history of commits for a particular project and their metadata make up a repository. Repositories can be kept in sync across different computers facilitating collaboration among different people. Automated version control systems are nothing new. Tools like RCS, CVS, or Subversion have been around since the early 1980s and are used by many large companies. However, many of these are now becoming considered as legacy systems due to various limitations in their capabilities. In particular, the more modern systems, such as Git and Mercurial are distributed, meaning that they do not need a centralized server to host the repository. These modern systems also include powerful merging tools that make it possible for multiple authors to work within the same files concurrently. The opposite of “open” isn’t “closed”. The opposite of “open” is “broken”. A scientist collects some data and stores it on a machine that is occasionally backed up by her department. She then writes or modifies a few small programs (which also reside on her machine) to analyze that data. Once she has some results, she writes them up and submits her paper. She might include her data—a growing number of journals require this—but she probably doesn’t include her code. The journal sends her reviews written anonymously by a handful of other people in her field. She revises her paper to satisfy them, during which time she might also modify the scripts she wrote earlier, and resubmits. The paper is eventually published. It might include a link to an online copy of her data, but the paper itself will be behind a paywall: only people who have personal or institutional access will be able to read it. The data that the scientist collects is stored in an open access repository like figshare or Zenodo, possibly as soon as it’s collected, and given its own Digital Object Identifier (DOI). Or the data was already published and is stored in Dryad. The scientist creates a new repository on GitHub to hold her work. As she does her analysis, she pushes changes to her scripts (and possibly some output files) to that repository. She also uses the repository for her paper; that repository is then the hub for collaboration with her colleagues. When she’s happy with the state of her paper, she posts a version to arXiv or some other preprint server to invite feedback from peers. Based on that feedback, she may post several revisions before finally submitting her paper to a journal. The published paper includes links to her preprint and to her code and data repositories, which makes it much easier for other scientists to use her work as starting point for their own research. This open model accelerates discovery: the more open work is, the more widely it is cited and re-used. However, people who want to work this way need to make some decisions about what exactly “open” means and how to do it. You can find more on the different aspects of Open Science in this book. The conceptual stages of your work are documented, including who did what and when. Every step is stamped with an identifier (the commit ID) that is for most intents and purposes unique. You can tie documentation of rationale, ideas, and other intellectual work directly to the changes that spring from them. You can refer to what you used in your research to obtain your computational results in a way that is unique and recoverable. With a distributed version control system such as Git, the version control repository is easy to archive for perpetuity, and contains the entire history. This short guide from GitHub explains how to create a Digital Object Identifier (DOI) for your code, your papers, or anything else hosted in a version control repository. git config --global user.email "fpsom@issel.ee.auth.gr"
git config --global user.name "Fotis E. Psomopoulos"
Replace my email and name with your own - ideally use the same email as the one you used for your GitHub account. drwxr-xr-x  4 dibtiger dibtiger  4096 Jul  9 02:32 .
drwx------ 20 dibtiger dibtiger  4096 Jul  9 02:32 ..
We can check that everything is set up correctly by asking Git to tell us the status of our project. It shows that there are two new files that are currently not tracked (meaning that any changes there will not be monitored). git commit -m "Let's do our initial commit"
Good commit messages start with a brief (<50 characters) summary of changes made in the commit. If you want to go into more detail, add a blank line between the summary line and your additional notes. This is the first steps in maintaining versions. There are a few more commands that you should be aware of, such as git diff and git log, but for the purposes of this exercise, this is sufficient. Version control really comes into its own when we begin to collaborate with other people. We already have most of the machinery we need to do this; the only thing missing is to copy changes from one repository to another. Systems like Git allow us to move work between any two repositories. In practice, though, it’s easiest to use one copy as a central hub, and to keep it on the web rather than on someone’s laptop. Most programmers use hosting services like GitHub, BitBucket or GitLab to hold those master copies; we’ll explore the pros and cons of this in the final section of this lesson. Let’s start by sharing the changes we’ve made to our current project with the world. Log in to GitHub, then click on the icon in the top right corner to create a new repository called RMarkdownDIBSI2018. As soon as the repository is created, GitHub displays a page with a URL and some information on how to configure your local repository. Click on the ‘HTTPS’ link to change the protocol from SSH to HTTPS. Make sure to use the URL for your repository rather than mine: the only difference should be your username instead of fpsom. Delta compression using up to 6 threads. Writing objects: 100% (19/19), 280.93 KiB | 2.19 MiB/s, done. Excellent job! You now have both the remote and the local repositories in sync! Exercise: Make a change to one of the two local files, commit, and push. Now that we have our own GitHub repository with an RMarkdown document, we can use Binder to give the community with a fully working version of the document, instead of a static (a.k.a. non clickable) version of it. You can create both these files locally (e.g. using an editor such as nano) and push them to the GitHub repository using the git add, git commit and git push commands we show earlier. Another approach is to directly create these files through the GitHub web interface, by clicking the Create new file button and then adding the content with the correct file name. A final option is to download these files from the links below, and upload them to GitHub again using the graphical interface. Now that we have everything setup, we can launch our Binder instance. Step 2: In the GitHub repo or URL field, enter the full URL of your repository, that contains all three files (i.e. the RMarkdown document, runtime.txt and install.R). For example, the URL could be https://github.com/fpsom/RMarkdownDIBSI2018. Step 3: In the URL to open (optional) field, type in rstudio and then select URL from the dropdown list on the right. Step 4: Click on Launch and have a break while Binder builds and launches your instance. It might take 10’-15’ to launch the instance. As soon as the instance start, select the .Rmd document and click on knitr. In a few seconds, the RMarkdown document will be built and a webpage should pop-up (you may need to click on “Try again” button for the external page to show up). Congrats! You now have a fully reproducible document that contains both your analysis and your data, and the people can recreate in the exact same environment! Go #OpenScience!